Material: wire and wood frame. Frame Size: 7 7/8" X 7 7/8" X 1 3/4". 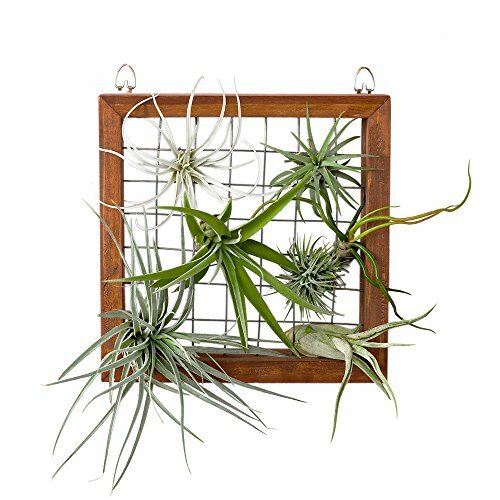 The length of each grid is approximately 1"
A wonderful way to display your tillandsias. No plants included. This square frame allows air and light to pass through. With two hooks at the back, easy to hang anywhere, wall, windows or outdoor. Handmade item. Material: wire and wood frame. Color: Teak. Frame Size: 7 7/8" X 7 7/8" X 1 3/4". The length of each grid is approximately 1".